In August 2012 I had the privilege of volunteering at the PRM Homeless Shelter in the small rural town of Port Antonio, Jamaica. I had met the Medical Director of the Shelter, Dr. Paul Rhodes, during a rotation here in Washington, D.C. 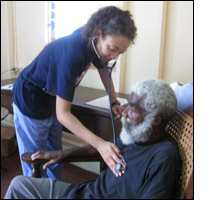 I have done medical mission trips before, but never in an exclusively homeless setting. I had no idea what to expect, but I found it to be one of the most rewarding experiences I've done abroad. I was asked to perform physicals, review patient files and medication lists, and make recommendations on medical care. I also helped revise their Standard Operations Manual, which will now include a section for common medical complaints that can be address by non-medical staff members. I was surprised that the same issues that plague the homeless population here in the U.S. are the same abroad - mental illness, poor social support, drug abuse, etc. We diagnosed conditions such as scabies, gastrointestinal disease, and skin infections. There were even some patients who were found to have undiagnosed chronic illnesses such as hypertension and asthma. Sadly, the lack of resources available to care for these vulnerable populations is also similar in both the U.S. and Jamaica. At PRM, they rely primarily on donations and volunteers. My experiences have enlightened me to the plight of the homeless, and I have since joined the National Health Care for the Homeless Council to get more involved.